Today is my 56th birthday, and it is also the day I leave for Africa – what a birthday present this is! 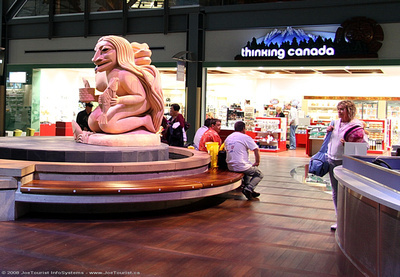 I am writing this entry as I sit in Vancouver Airport waiting for my flight to London/Heathrow. I had to take a 1:30pm flight from Victoria; however I don’t depart for Heathrow until 7:50pm, so I have five hours to kill. I also have another five hours to wait in Heathrow before I depart for Johannesburg. I left Victoria at 1:30pm on the 13th and I should arrive in Johannesburg at 7:10pm on the 15th! At least I don’t have to clear security again here in Vancouver, however I’m in the area where Air Canada’s flight leaves and there are no shops open. At the moment, it is completely empty except for the odd passer-by. It looks like the Vancouver airport is being expanded in a fairly major way. Unfortunately, they have turned it into a maze of corridors. People watching – I spot a woman packing her own pillow. I have to wonder if she is really going to drag that thing along with her wherever she is going. Another woman is wearing a small backpack which has a teddy bear in it. There appears to be nothing else in the backpack. She is busy on the Internet terminal doing her email. Perhaps the teddy bear has a large circle of friends? It was drizzling when we left Victoria Airport, and it is raining pretty hard outside Vancouver Airport right now. It will be a welcome change to experience the hot and dry climate of Northern Botswana. By the looks of the climate tables, it should cool down a bit from the 40°C in Northern Botswana to the 25°C range by the time I travel down the South African coast to Cape Town. I have a hot meatball sub from Subway for an appetizer around 4:30pm this afternoon after finding a food court about five minutes’ walk from where I had setup beside the gate. I am still in a secure area, so at least I don’t have to go through another security check just to have a meal. I’m not sure what Air Canada will serve after we are onboard, since our 7:50pm departure is well past the dinner hour. We are scheduled to arrive at London/Heathrow at 1:25pm local time, so I expect they will serve us a meal before our arrival. The stories about how Air Canada has cut back on in-flight services and meals makes me wonder what to expect on the upcoming flight. There are a few dozen people in this area with the food court and shops, but the airport still looks pretty empty to me. There are only seven international departures up on the notice board for this evening: Amsterdam, two to London, JFK New York, Sydney, Taipei, and Hong Kong. I’m bored already, and I really haven’t started my journey. It seems everyone else is in the same situation: bored and killing time until their evening flights depart. One bonus: there is free Wireless Internet in the airport, so I can read and send email and browse some news and other online sources. I check my weather website: it is raining at home. It is now 6:00pm and I’m back at the gate. There are sensible stout women waiting for the flight “home” to England (I assume). Almost all of them have a bag of duty free goods, and some of their feet are already swollen. The shops in the gate area are now open, so they obviously know there is little business when there are no flights scheduled (like this afternoon). It looks like the rain is settling in, so I will be glad to soon escape from this grey, cold and wet dreariness. My time spent traveling is precious to me. The holding lounge fills up by departure time. People are constantly after the gate staff to change their seat assignments, and they seem to good-naturedly put up with this endless parade. When I board there are no spare seats. I have a window seat and the seat beside me is occupied by a woman from Victoria. I’m happy she is quite small build, so we both have room to move. We will be over nine hours in the same seat. The aircraft pulls away from the terminal and then just sits there for about 20 minutes. The pilot finally tells us there is a mechanical problem, so we pull back into another gate at the terminal and spend the next two hours sitting around while they fix the aircraft. The crew and pilot keep us informed along the way, and we finally depart two hours late. It’s not a problem for me, since I have a five hour layover in London/Heathrow, but other passengers with tighter connections are justifiably worried. Once we level out at cruising altitude, a nice dinner is served with drinks included. 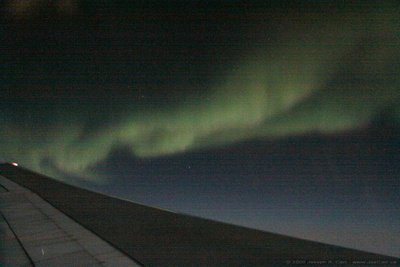 I am peeking out the window regularly, and I notice a nice aurora visible over the wing as we fly over the polar region. A couple of hours before we arrive, a nice breakfast is served. Thank goodness I managed to get a couple of hours sleep in-between. We have a 100 knot tailwind for most of the flight which saves us a full 45 minutes, so we end up arriving just over an hour late at 2:00pm local time. It is 3:45pm as I write this in Terminal 1 at Heathrow. We arrived at Terminal 3, so I had to catch a shuttle bus to Terminal 1 and clear security again. Terminal 3 is modern, but Terminal 1 is decrepit by comparison. I can’t find any Internet connections – even if I am willing to pay. All I can do is wait around. They don’t post the gate numbers until 30 minutes before boarding time. When I’m in strange airports, I like to find a gate early so I’m not rushed, but I can’t do that here. Posting to my blog will have to wait until I get to the hotel in Johannesburg. The woman with the teddy bear shows up at the gate for my flight to Johannesburg. I hope she’s not on my safari! There are a few empty seats on this flight; however most people have spread out to take advantage of the extra space so they can stretch out and sleep. The rest of us make do with trying to get some rest in a single seat. 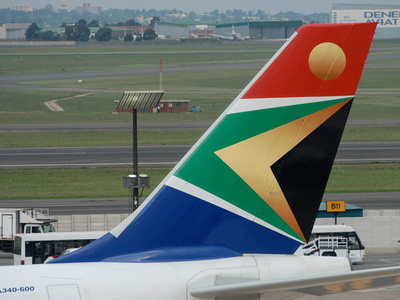 South African Airways in-flight service is very good – the meals are tasty, the cabin crew gives us good service, and the aircraft appears to be brand new (unlike Air Canada). We depart on time, and arrive early – what more could one ask for from an airline? I rest fitfully throughout the flight, but I flip open the window shade regularly to see what is visible outside. The Orion constellation is lying on its side and is a pretty sight despite the illumination from the full Moon. Toward dawn there is a beautiful sunrise over Southern Africa as I am served breakfast just before our landing. The man sitting beside me is from Mozambique, and regularly travels to/from Johannesburg since he is involved with airport equipment. He is returning from a training trip to London. Despite arriving at Johannesburg airport a bit ahead of schedule, Derek from Wilderness Safaris is there to meet me this morning. He suggests I get some South African Rand currency from the ABM in the terminal, and then he puts me on the shuttle to the Mondior Concorde Hotel. It is only a 15 minute drive from the airport. 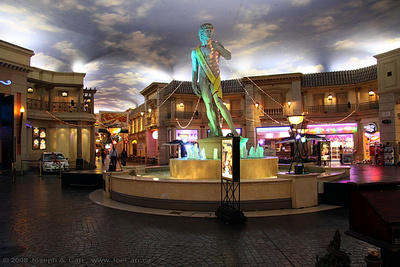 This hotel is part of a larger gambling complex called The Emperors Palace, which is obviously a direct copy of Las Vegas – including all the shops, the fancy concourses, and of course the noise! The hotel is nice and quiet, and although they don’t have any non-smoking rooms available at 8:30am, I take a smoking room in the interest of getting to bed as quickly as possible. I sleep for four hours and then get up to walk around the casino this afternoon – they obviously took liberal use of the designs of Caesars Palace or the Venetian in Las Vegas. I have dinner this evening at Squisto Ristorante in the casino mall area. It is recommended by the desk clerk, since their own Oriana restaurant is closed. I ordered a Spanikopita (spinach & feta pie) to start and Pescatore (seafood) pasta as a main. They only have a red house wine – no selection, but it was good (not too dry). This place reminds me of the Venetian in Las Vegas, except the prices are about a third of the Venetian’s. This evening’s dinner cost about 180 Rand (CD$23) including two glasses of wine and tip. This evening I have to repack my two bags, since I will be storing the large one at the Mondior Concorde hotel here in Johannesburg while I take the small bag on the Botswana Safari. I’ll leave my notebook computer and some of the bulkier stuff here. All I need is cameras, clothes and my more compact electronic technology while I’m off on safari. When I’m traveling in Northern Botswana we will be transferred between camps in small aircraft. The maximum dimension for a bag is only 9″x12″x24″ due to the small cargo holds of these aircraft. It’s a good thing I purchased a new backpack MEC Fast-Track Roller from Mountain Equipment Co-op. It is actually two bags in one: a rolling bag with a handle that also has shoulder straps, and a smaller over-the-shoulder bag that is…you guessed it, only 9″ high. The small bag is is the one I’m taking to Botswana. Speaking of technology, my power adapters all work here on the 220v 50Hz power. The 2 prong conversion plug I brought along works fine. My Rogers cellphone works from here – I call home successfully to check in with the family. I expect the next time I can use my cellphone will be when I return to Johannesburg on Oct 25th, since I’ll be staying in remote bush camps most of the next 12 days. Internet is not free from the Mondior Concorde hotel, but I purchase a low cost plan and the wireless connection works fine from my room. I post an update to my JoeTourist blog, and I also post a few preliminary photos on my Flickr space before going back to bed. Tomorrow I start my safari adventure by flying to Livingston, Zambia! This entry was posted in British Columbia, South Africa, UK and tagged airline, casino, hotel, packing. Bookmark the permalink.